I am trying to setup a shared mail box/extension for example ext. 350. This extension doesn't have any phones associated with it, the sole purpose is to receive the VM and distribute it to two people in organization, for example, ext. 300 and 310. Extension 300 is trying to record a greeting on 350 by dialing *98350, after inputing the PIN they get a message "this feature is not available". Ext 300 has admin privileges so it should be able to do pretty much anything on the domain. I can temporary provision the phone to register to 350 but that seems cumbersome. What are we missing? Would hot desking solve the issue for you? I don't think so. This is the scenario. The calls are coming into a hunt group which consists of four extensions. If no one answers the call they want shared voice mail to pickup and take a message. That message would be delivered to two email addresses. That is all they want, we just couldn't record the greeting for that VM from any of their phones. 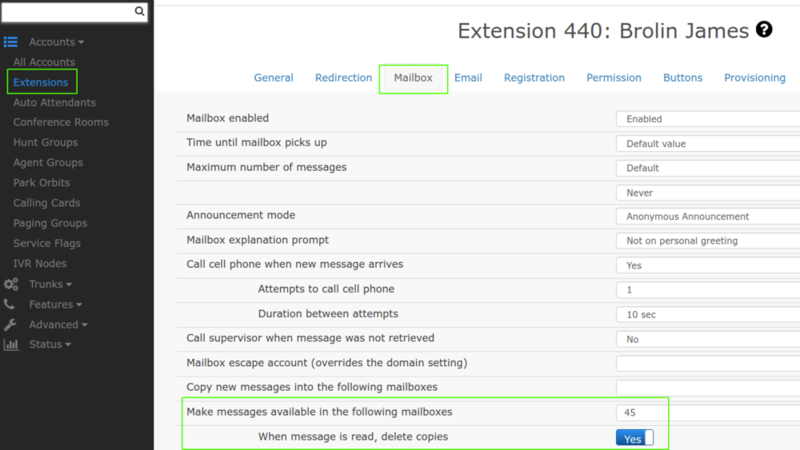 You can use a "Make messages available in the following mailboxes" setting available in the mailbox section on an extension level. You will have to do that setting on all 4 extensions and you can choose 2 of your extensions to send the email, or just use one ext to send 2 emails. Email setting would be "abc@d.com;paper@doc.com"
Thank you for your reply. I tried that but that doesn't solve the problem either since one of the recipients doesn't have an extension on the domain, he is not a part of the hunt group, he is the boss and wants to receive an email when no one in the office doesn't answer the call. The other recipient wants to keep their VM separate from this scenario. So the only way I knew to do is to create "shared" extension/ VM. At this point we just registered a phone to that extension, recorded the greeting and for now it is working. I just don't remember not being able to record the message from another extension in the domain. All he wants to do is receive emails when no one picks up the call on that hunt group right? Just turn on the setting: "Send email about missed calls to" on the Hunt group and enter Boss' email there and you should be all set right? No, he also wants to receive the VM that caller leaves. But the issue is why a user cannot record a greeting from another extension. To me that seems pretty basic. I would just set up an extension and then share the PIN for that mailbox with the team. Then they have control over that mailbox, including recording annoucements and so on. In addition to that you can use the mailbox sharing option, so that the agents automatically receive a copy from new mailbox messages in that mailbox. There must be something fundamentally wrong with the "feature is not available" - can you call into another extension mailbox successfully? This should be really a fundamental function that should work.